The highest July heifer in Europe is RED!!! The highest GTPI & NM heifer of the European intermediate run is a RED heifer: Wi-Li-Jo Mod Khloe-Red - sold as an embryo through the Holstein Plaza Internet auction. She is a VRC RED Modesty daughter ouf of the Canadian Islehaven Gold Dancer cow family with GTPI +2862 - (#2 GTPI heifer overall in Europe!). 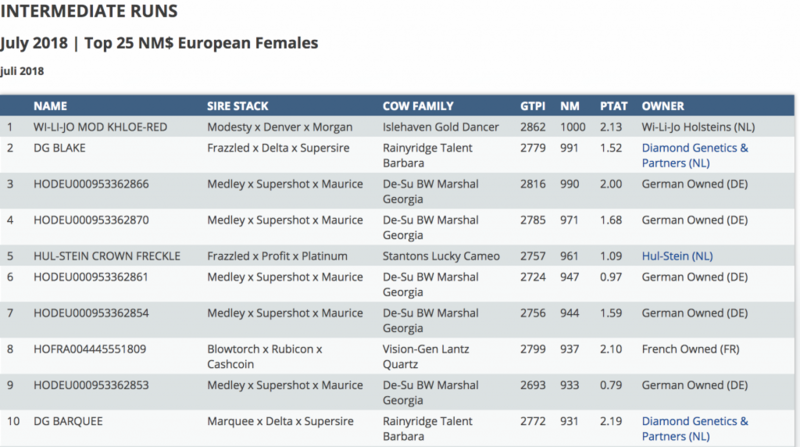 2 Heifers in the European Top 10 for NM and GTPI this run were both from the same family, DG Blake and DG Barque with DG Blake on the 2nd position in the Net Merit ranking this run, she is a NM $ 991 Frazzled x Delta going back on the All-American and All-Canadian cow Rainyridge Talent Barbara EX-95-USA!